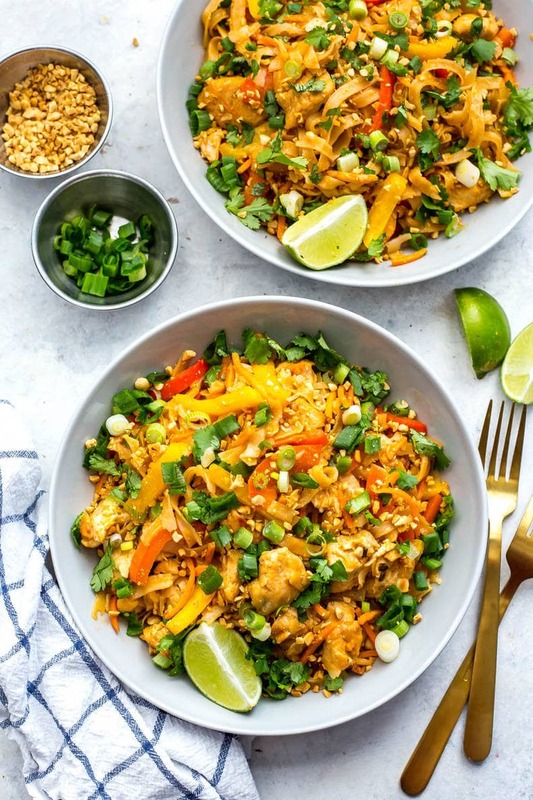 This Instant Pot Chicken Pad Thai is a super quick and easy one pot pad thai recipe that is perfect for your weekly meal prep - the noodles cook in the pot along with the other ingredients for minimal clean up too! Add olive oil, chicken, garlic, soy sauce, pad thai sauce, water and rice noodles to Instant Pot in that order, leaving noodles floating slightly above other ingredients. Set to manual and pressure cook on high for 2 minutes. Instant Pot will take about 10 minutes to pre-heat and then 2 minutes to cook. When complete, press cancel and do a quick release of the steam, waiting until the pressure gauge drops back down and the lid is safe to open. Add carrot matchsticks, bell peppers and half of peanuts, tossing carefully with tongs. Place lid back on and let sit for 5 minutes. Remove lid and serve, then top with green onions, remaining chopped peanuts and cilantro. Enjoy!